Mirraloy FM Pre-Keyed is designed to provide a high degree of accuracy while also exhibiting high strength, ease of machining, and long-term wear life. 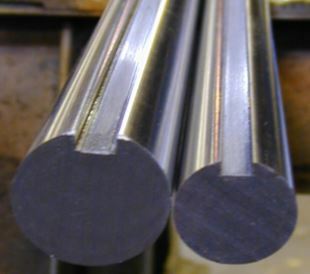 Most other keyed shafts are typically “Cold Roll” which generally means you get mild steel. Typical hardness is Rockwell “C” 26. This shafting material is based on a modified 1144 steel. Provides superior strength and toughness in service due to its micro alloyed chemistry. The following tests: roto bar, mechanical, warpage, and machinability are performed at the manufacturing level, prior to keying the shaft, to ensure proper product performance in the field. Call or email us for a quote. Exhibits nearly 50% more tensile strength than that of a C1018 and up to 25% more than C1045. Reduction of Area 25% min. Sheffield™ FM Redi-Keyed is the past protected tradename of North American Steel Company. Centra-Key is the past protected tradename of Ludlow Steel Company.